I knew next to nothing about this group and I bought this record on recommendation of befriended clerk in my favourite record store. In terms of music this is mix of rock, electronic, dance, ambient and jazz music. The title of this cd can be translated as Free Exchange and this is what makes it close to jazz because in couple of songs musicians go free and improvise. Although it is still rather a shy try it shows they have inclination towards more ambitious music and I wish they go in that direction wholeheartadly because it's making their music much more interesting and inspiring. The band consists of Marcin "Banan" Banasiak (drums), Mikołaj "Miki" Harasimiuk (guitars&ambients), Krzysztof Pieszak (electric piano&synths) and Cezary Potocki (bass). This album is second in their career after debut titled simply Kerd which was issued last in 2008. These guys are not yet signed with any record company but nonetheless managed to print this record on their own. It shows that their dedication to music is as strong as their musical skills. I feel we shall hear more about these musicians in future. One of the reasons that polish contemporary jazz scene is relatively unknown to international audience is that it is so much avant garde. The reason lays in "Brain", but I am not thinking only about this misteriuos organ located usually in our head but rather of the famous music club located in Bydgoszcz, in northern part of Poland, foggy and cold Pomerania. So it happened in Poland that after 50ties when polish jazz was born, 6oties when it reached maturtity and blossomed, 70 ties when it went abroad and become known in other countries, in 80ties it became stagnant and closed to musical developments that took place outside the genre. It coincided of course with the dramatic situation in the country which after the Solidarity movement was crushed by gen. Jaruzelski in 1981 became very bleak, grey and uninspired place to live in. Then year 1989 happened and the communism was over but it took many years before country started to recover from the gloom of the past. In such a dire conditions few crazy poeple like Ryszard Tymon Tymański, Leszek Możdżer, Maciej Sikała and Mikołaj Trzaska from Tricity (consisted of Gdynia, Sopot and heroic Gdańsk) formed a group called Love (Miłość) that was to change the course of history o polish jazz. As well-known critic Tomasz Szachowski once wrote: "Miłość began a creative ferment, it gathered a group of believers, it led to the creation of a new stream in Polish jazz. Today this stream gathers at least over ten musicians, it has its own record company (Biodro Records), its own festival ("Muzyka z Mózgu" / "Music from the Brain"), and a number of clubs of which "Brain" located in Bydgoszcz is the most important." This new movement was called yass in opposite to jazz and was always alternative to main stream, avant garde, experimental and free. 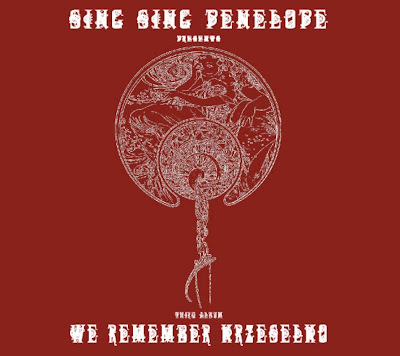 Though Sing Sing Penelope is a band that belongs to second generation of young polish yass players it retains all characteristical features of its founders. All these guys are excellent players, very well educated, very creative and active in multiple projects and bands that play similar progressive music like Pink Freud, Contemporary Noise Quartet, Ecstasy Project or Robotobibok. These bands all form the core of polish avantgarde which is another interesting aspect of thriving polish jazz scene which cerainly should draw more attention from foreign listeners and recording companies. There is only a handful of polish jazz musicians that are signed to the best international recording labels. One can name Tomasz Stańko and Marcin Wasilewski that are ECM artists and Leszek Możdżer who records for ACT. To those very few now is joining young polish pianist Paweł Kaczmarczyk with his Audiofeeling Band who recently made his debut album for ACT titled Complexity in Simplicity. I found a very nice promotional video prepared by ACT for this record so my work this time is easy and short because I shall only write few additional words about up-to-this-date career of Kaczmarczyk plus my opinion about his music. And Paweł and his companions are paying back for Loch's trust by delivering on this record music that is so varied and refined and yet sounding so simple and attractive that I believe he must be very glad now that he made such a proposal to this young pianist from Cracow. Kaczmarczyk is accompanied on this recording by the elite of young polish jazz players who are constantly shifting both personel (from trio to septet) and stylistical characterstics of this music (from bopish to cool and further to chamber jazz). The effect is very attractive because recording is dense enough to focus ambitious listener attention for long and yet accesible enough to be listened to at ease for simple pleasure as well. All in all, it seems the new star on polish jazz sky has come up. Congratulations Paweł! Recently I posted about Mieczysław Kosz, one of the most significant figures in history of polish jazz. Now I return to his music with disc dedicated to him issued in White Raven Of Black Vinyl Club edition of Polish Jazz Association. Last time I wrote a lot but this time I shall keep my note short because I want music to speak for itself. We often treat jazz and classical music as somehow opposite because of the attitude toward improvisation. This is nonsense of course. There is only one music. Moreover improvisational element in music was always present. In classical music as well until very recently when it vanished and classical music became closed genre. Great pianists of romantic era for example, Chopin, Liszt or Schumann, we know it very well, all improvised. In fact in their times ability to improvise was at least equally respected as their compositional talent. 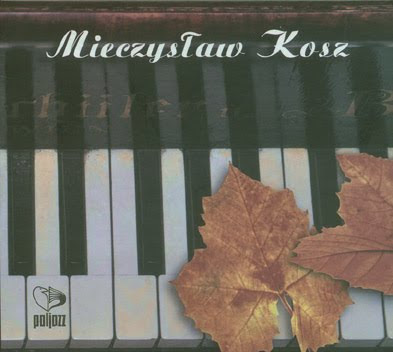 Kosz is so unique because he improvised effortlessly in all possible genres, from classical through jazz to pop music. When we look at the program of this specific album we find besides Kosz own compositions (Signals, Before Storm, Illusion, Too Late) improvisations on well known jazz standards (Summertime, Some Days My Prince Will Come), on folk tunes (Black Eyes, Hey You Forest Violet), on polish (More Birds, Two Glasses of Wine, You Shall Not Forget Me) and international pop tunes (Michelle, Rosemary's Baby, Laura, Granada). In this selection we see first the reflection of early Kosz whose career started by playing in clubs and restaurants of Kraków, Zakopane and Warsaw but also the sheer scale of his talent that covered all music that poeple were really interested in. PS. In my both notes on Kosz I used information from wonderful book of his biographer Krzysztof Karpiński titled Only Sadness Is Beautiful. Great thanks!!! How ambitious! How they dare to choose songs like those and assume that they can show something new, original, something we have not yet heard in numerous versions of these standards recorded up-to-this-date?! Then I immadietely bought and simply ran home to listen to it. 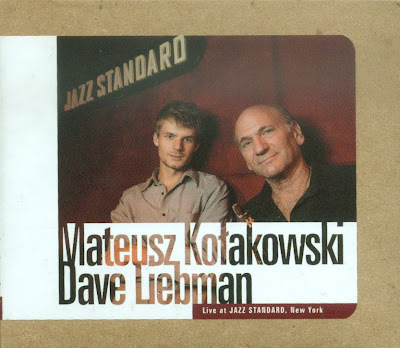 Let me first pay tribute toDave Liebman who is musician I respect a lot. What I admire in him is that not only he is very fine and creative saxophonist, clarnecist etc. but that he also teaches a lot and is known for coaching young talents very much like Art Blackey, Miles Davis (with whom he collaborated in 70ties) did or Tomasz Stanko does. To reach such a level of musicianship that you feel need to share with young artist what experience and wisdom you already gatherred is for me an exceptional quality in artist showing that he reached the highest level not only as musician but also as human. And this is by the way exactly what polish young musicians need, since they often have excellent technical skills but they obviously lack contact with top jazz players to form their own style, to mature to the level of excellency that is separating craftmanship from artistry. Mateusz Kolakowski, 22 years old polish artist is prodigiously talented pianist, who concerted in Poland and abroad even as a child. But who now is somewhat in shadow of other young lions of polish jazz piano (the level of competition is very high in Poland as far as this instrument is concerned). If he wants to become significant figure in polish jazz he simply must learn from the best, work hard to create his own, unique sound and also keep in touch with the audience that is distracted by multiple interesting projects of other musicians. Yes, polish jazz scene is thriving and even such a talented musician as Kolakowski cannot take it for granted that he shall attain success if he does not show something new and worthy on regular basis. Taking all this into account his recording with Dave Liebman is excellent move. He did what Oles brothers are doing on much larger scale (look into the cd review prior to this one) that is to make recordings with world top jazz players. By this he was able to put this record in the spotlight of polish jazz audience. But he also showed through this collabolaration that he is capable to inspire such a great and creative artist as Liebman. He showed that he also would like to be the artist searching for what is new in jazz, to reach the boundaries ot this musiacal genre, to be in avant garde of what is in jazz free, experimental, improvised. We shall closely observe this young man next steps. By this record he clearly showed great potential for future. Oles brothers, Marcin on bass and Bartłomiej on drums, form one of the best and most creative rhytm sections in polish jazz these days. This album comes as second album for Marcin Oles as a leader and is featuring two foreign musicians whose play is of stellar quality. 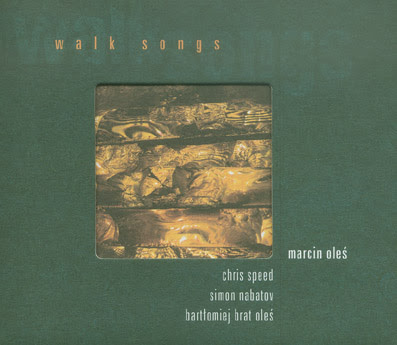 Since in my country guests always come first let us focus at the beginning on Chris Speed playing on tenor saxophone and Simon Nabatov on piano. Simon Nabatov is no less interesting story. He was born in Moscow, Russia in 1959 where he received excellent musical education. Being 20 he benefited his jewish origin and managed to emigrate with his whole family to USA via Italy, where in Rome he started to play jazz accompanying Chet Baker and Art Farmer. He soon relocated to New York, a city of dreams for every jazzman and still a challenge for any musician trying to survive there making for his living as an artist. He was fortunate to be able to study in Juilliard School and struggled to establish his name as jazz musician. He then moved back to Europe however and is living in Germany now playing both jazz with the likes of Paul Motian, Steve Lacy , Arthur Blythe or Mark Helias and classical music of Russian composers. Truly unique personality in European and world jazz. To record his own album with such musicians is great achievemnt for Marcin Oles and make us curious who is he to be able to persuade artis of that calibre to cooperate with him? He was born in Sosnowiec in 1973 and his musical eduction was conducted by his father, himself double bass player as well. What is exceptional in his brilliant jazz career is that he started to play succesfully with creme de creme of young, unorthodox polish jazz players (Adam Pierończyk, Mikołaj Trzaska and Andrzej Przybylski) but also that he very early displayed great potential as leader and seeker of innovation in jazz. This creativity together with excellent musicianship was soon realized by players in Poland but Marcin also showed extraordinary persistence in drawing to him the great foreign personalities in world jazz. Inn result he may now boast to have recordings with such artist as Theo Jorgensmann, Jean-Luc Capozzo, David Murray, Ken Vandermark, Erik Friedlander or Herb Robertson. What is true for Marcin Oles is also true for his twin brother Bartłomiej who plays on drums since they usually play together. I shall write about Barłomiej more extensively on another occasion just not make this post too long. And how about music? In my opinion it's simply excellent, higly recommendable. All compositions are by Marcin Oles except Long Day and Q Square which are by Bartłomiej Brat Oles. They are as good as one can expect and I simply see no weak points in this recording. By this album Marcin Oles convinced me of his exceptional talent and I shall wait for his next recordings with impatience. He is new and significant force not only in polish jazz but in european as well.